In the June 14, 2016 Ask The Headhunter Newsletter, a seasoned job seeker confesses to blubbering during interviews. Thanks for bringing up a subject that many people are embarrassed about. We’ve discussed interview butterflies here on the blog, in Butterflies in your interviews? If you can program your mind this way as you walk into an interview, you’ll be way ahead of your competition — without stumbling. Think of the meeting as your first day on the job. You’ve been hired, and now you need to get to know your boss and understand the work. Don’t behave like a supplicant begging for a job. Behave like an employee discussing your first assignment. This gives a new meaning to interview preparation. Don’t just study news articles and other facts about the company: research the interviewer! Look the interviewer up online — think LinkedIn and Google, or relevant industry journals. Study the manager’s style and approach. Learn about their background and about other jobs they’ve held, and be ready to pepper them with relevant questions when you need a cognitive break from the Q&A and when you need time to gather your thoughts. This will help you roll with the punches. My favorite suggestion is from a reader who believes — like I do — that worst-case planning is the best way to avoid nervousness. Always have a last-ditch trick up your sleeve. (I don’t normally suggest using tricks of any kind, but hey, this is a reader’s idea…) It can make you feel virtually invincible, which can change your entire interview for the better, even if you never need to use it. This reader brings props! In other words, when you get stuck, distract the interviewer while you pull yourself together. Of course, if the props are really good, all the better! Conquer the butterflies before they land. What do you do to conquer interview butterflies? Post your tricks… er, methods… and let’s debate what works best! If your condition is almost pathological, such as the pounding heart, flop sweats, stammering, wet palms and the like, similar to the fear of public speaking that some have, you may benefit from some pharmaceutical assistance. Your family physician can determine if it is safe for you to take a mild drug known as a beta-blocker, which will cut down on the physical symptoms dramatically. If you still have crippling anxiety, there are mild forms of anti-anxiety drugs as well. You only have to take these ONCE for the interview day, and there are minimal to no side effects if taken sensibly. I tell my clients the one best way to be less nervous in an interview is to have another interview lined up. If all your “job eggs” are in one interview and your interviews are few and far between, the interview takes on tremendous significance and a lot of added pressure. If you have several interviews and other opportunities in the pipeline, you will be less anxious about each interview. Also, I coach my clients not to use the words nervous or anxious. Nervousness and anxiety is undefined fear. Use the word fear or scared, identify what you are scared of and work on changing that issue. Don’t forget the basics. Scout the venue out before, so you know where to go. Ask for parking details, so you know exactly where to go when you arrive. Nothing blows away all the planning, butterfly chasing tricks than running late. Never assume. Think you know your city like the back of your hand? But did you know about construction on your planned route, traffic lights not working? fender benders? Gas tank almost empty? Right company, wrong address. You were meant to go to the “other office”. Also, understand that butterflies are natural. 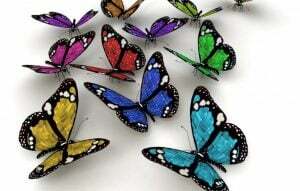 If fact do some research on stage acting…there are some highly successful actors and actresses who suffer butterflies before EVERY performance. Even though they have years of experience and are following a fixed script, that they know they’ve performed well countless times. They are still there. They have their tricks to get on with the show that may be applicable to interviewing. If you are on the other side of the table, a good interviewer should anticipate and pick up on nervousness. And do everything you can to put people at ease. The person shouldn’t have to game you to buy time, you should offer a respite. That’s one reason interviews start with small talk. At times I’d flip the sequence, start with a tour, take the person for a soda or coffee, walk and talk. And when you assess a candidate you should be able to factor out nervousness and spot core values. A good interviewer is a host, a host who represents the company. And a good host makes people feel at home. 2) I treat the day before like an athlete preparing for a competition – very healthy eating, drink lots of water, no alcohol, a brisk walk or light exercise. This makes me physically relaxed, comfortable, and confident. 3) I understand that if the job is not right for me, nothing I do will get me the job. An “unsuccessful” interview doesn’t mean you failed – it just means the job isn’t the right one for you. Solving this problem is yet another benefit of networking and informational interviewing. Many of us only interview every couple of years, when there’s a lot at stake and the pressure is on – no wonder we get the butterflies. Instead, we should be continuously “interviewing” people in our field (or in our new field) and they should be at a level that they could hire us if a job were available. If I am gainfully employed, and not looking for something else, I should be having at least one interview a month where I am meeting with someone at the hiring level – not to be asking about jobs, but just to discuss business, get ideas, see what I can do for that person, and to get the names of people I can talk with later. Then, by the time I need to interview for real, I should be calm, relaxed, and should be able to handle the job interview in the same manner as my previous informational interviews, with the addition of discussing how I would help the potential employer make and save money, get and keep customers, and / or prevent or solve problems. When it comes to interviewing, practice really does make perfect. So instead of only reading books about how to do it, we should be continuously doing it. Also, the book Ask the Headhunter would be a good read regarding this topic. Let me also add, having an interview presentation is an excellent confidence booster. The presentation has all the information a hiring manager needs to know to make an informed decision. Developing the presentation is an excellent way to prepare, it makes sure the candidate communicates the information they want the interviewer to know, and it compensates for a bad interviewer. For more information check out http://www.interviewbest.com. Go to lunch with other engineers and managers as often as possible. Interviews require the same social “muscles” at used at lunches. Also consider NLP or similar therapies to reset the reflex. Take the route to the interview twice, if possible. Once over the weekend, when it is uncrowded. And once on a weekday at the same time as your interview. Being familiar with the route removes one source of nerves so that you can shine during the interview. Remember, if you are called for an interview they think you’re qualified for the position. Your job is simply to reinforce what they already think. Also, this is a two way street; the interviewee has power too. You may not even want the job after you learn more about it and meet some potential co-workers. So take the pressure off yourself. Since most interviews begin with some kind of ‘who are you’, it makes sense to prepare at least an outline of an answer that you can diliver when you don’t have full access to your brain. When someone calls you to schedule an interview, ask questions. The more you learn about what’s going to happen the less an interview is some great unknown. I’d like to know in advance if I’m interviewing with one person or a panel of four, if I have to fill out some paperwork, if I have to take a computer skills test. Anything we can do to avoid being blindsided will help us perform at our best. @Eric: I’m with you. The best antidote to interview stress is to have other options. So if you’re blowing it, maybe you don’t belong there. So flop sweat is a healthy signal to move on. Good observation! I’m a bigger fan of what you’re suggesting than the idea of going on interviews regularly for “practice.” Lunches and casual meetings to discuss business are a great way to get comfortable talking to others in your field. And they can lead to interviews :-). Rarely will you come across a professional interviewer. Most of the people you’ll meet with feel more uncomfortable than you because they hate interviewing and aren’t good at it. With this in mind, follow Nick’s advice: Make it a conversation, not an interview. Make the other person feel at ease, make them feel comfortable. Go for the connection. That’s at least as important, if not more important, then your skills and experience. I have done plenty of job interviews and also interviewed some prospective employees myself. What works best for me is to behave like you are already on the job and the discussion is about a problem you need to solve, strategic advice or guidance which is expected of you, your point of view – however, you must really know what you are talking about, what the job is about, otherwise ask for details first! And, I reckon, there is no good interview if there is no “initial” chemistry between the interviewer and the interviewee. That said, I very rarely enjoy being interviewed for a job (there is always some degree of stress, however much you prepare) but the approach above has worked for me so far. First and foremost,do not think of it as an interview in the strict sense – focus on talking business, provide your insights, etc. And I do agree on a point Nick makes: Some interviewers are really dumb and dull, and just read questions from a piece of paper – I am not even sure those interviewers always understand the answers one is providing. One respondent mentioned beta blockers for this kind of stress-inducing situation. I have used and recommended two other related things: propranolol (used for PTSD as well as stage fright, this is an old-line blood pressure med working on one’s adrenaline response) and good old Tylenol, available everywhere. Just Google “Tylenol for anxiety” and you will see numerous studies and stories, one from Psychology Today in mid-2013 reporting on a double-blind Canadian study, one of many. Beyond that sort of physical process, well, practice makes perfect, right? “…have other options” is key advice. And, of course, coming into any situation as if you belong there (minus the ego) helps to extend a relaxing atmosphere. “Do the job” in the interview vs. ping-pong interrogation style Q’s that are too sterile. “Fear” disappears when one is prepared, arrives early and hasn’t bet the farm (desperation) on a particular opportunity.